We seem to be slipping into that part of the year where debuting programmes are short on the ground, so this week's Matt on the Box focuses on a couple of shows that came to an end this week. We start with possibly on one of the most successful TV programmes of the year as the current run of Celebrity Big Brother has been gathering audiences of up to three million on a nightly basis. This week saw the final, which I personally thought to be one of the closest run contests in Big Brother history. The person I expected to win was eventual runner-up Katie Hopkins; The Sun columnist who went in to boos and came out to cheers. Although Hopkins did reveal that she wasn't exactly the pantomime villain that people expected her to be I still didn't warm to her enough to want her to win. Meanwhile both Michelle Visage and Keith Chegwin, who came fifth and fourth respectively, were likeable candidates who both brought plenty of humour to the house. My personal winner was Calum Best, who came across as a genuinely decent person that stood back during arguments but also spoke up when he needed to. Sadly Calum came third whilst late entrant Katie Price ended up winning the whole thing and inadvertently broke Twitter as a result. I feel people were genuinely disappointed that Katie Price didn't cause a stir when she entered over a week later then everybody else. But I believe that she didn't want to rock the boat and, as she'd been watching at home, she already realised there was enough conflict without her adding to it. I feel it was a mistake to put Pricey in that late and had she been an original housemate she would've provided a lot more entertainment. Ultimately I don't think she had enough screen time to deserve to win the programme but at the end of the day she was the finalist who had the most loyal and established fanbase. As a whole I've found this series of Celebrity Big Brother to be compelling but at the same time I don't know if it's been that entertaining. 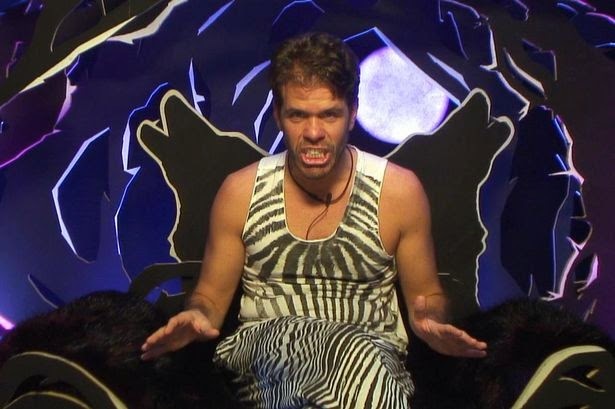 The reason why I've been so captivated by Celebrity Big Brother can be summed up in two words; Perez Hilton. The celebrity blogger and general irritant has dominated the show particularly due to his rivalry with Katie Hopkins as well as his belief that it is 'The Perez Show'. Hilton became the villain of the piece after his actions forced legendary soul singer Alexander O'Neal to leave the house possibly because he thought he may do him so serious physical harm. Although Perez's presence has made the show an interesting watch I do believe that he's taken away the fun element from Big Brother. The nightly programme has generally focused on the arguments between Perez and Hopkins therefore the majority of the tasks have become a secondary priority. I do feel this is a shame, especially for the quieter contestants such as Cheggers and Patsy Kensit who probably thought that there would at least be a little bit of fun strewn between all the bickering. Last year's January run of Celebrity Big Brother, which was met with equal acclaim, did have its fair share of conflict but this was punctuated by a lot of laughs and the whole Lee Ryan affair. This year's Celebrity Big Brother has indeed been memorable but I'd surmise that it's probably been for all the wrong reasons. So I'm hoping that, when CBB returns in September, it brings a mixture of both conflict and fun the latter of which has been missing from this current series. Making the most of the lead-in from Celebrity Big Brother was Channel 5's latest 'social experiment' programme 10,000 BC. The programme's premise was to dump twenty modern-day Brits into a situation as close to Stone Age Britain as physically possible. The first issue with the programme is that, going by the first episode alone, the producers are incredibly lenient on the participants. They've purposed built their huts for them, allowed them to wear socks and boots and provided clean running water. Additionally there seems to be an entire hospital on sight just in case anybody feels a bit woozy and needs to leave the process. This happened early on in episode one when the oldest member of the team, 65-year-old Caroline, collapsed and had to be carted off before the experiment had even begun. The first two days in camp were also made easier by the presence of survival expert Klint Janulius, who appeared to be more excited about the experiment than any of the campers. It was his job to properly prepare the group for the task ahead and get them thinking about stuff like building fires. To aid their progress, Klint presented them with a dead deer which they then set about pulling apart to use for food and other essentials. The first episode ended with Klint making his departure as the gang got used to the place they'd call home for the next eight weeks. There's really no getting away from the fact that 10,000 BC is Channel Five's attempt at recreating The Island with Bear Grylls. Unfortunately, unlike that programme, there aren't any memorable characters and in my opinion the participants here had far too much support. Crucially though, episode one was devoid of any conflict, which I believe is a necessary component of these types of programme. Whilst 10,000 BC did provide somewhat of an interactive history lesson, I didn't feel it was entertaining at all and I feel it didn't live up to the hype of the trailers that Channel Five have been running for weeks. When it first debuted last year, The Jump was full of disasters from injured contestants galore to technical malfunctions plus a general lack of interest from the viewing public. So I was particularly bemused by the news that the celebrity-based winter-sports themed reality contest was back for a second series. Watching sporadically throughout the week, I can at least see that the producers of The Jump have done their best to improve on last year's series. Firstly they've introduced the subs bench whereby the contestants who were eliminated first are on hand to replace any injured contestants. The fact that the subs bench contains some of The Jump's more interesting characters; such as Heather Mills and Dom from Gogglebox, means that I've got my fingers crossed that someone may slip up before the final. Secondly, the series appears to have slightly cut back on the use of pre-taped events and Tuesday's episode saw the compelling snow-cross event. This was a particularly brutal affair as three celebs knocked into each other as they desperately tried to finish a hazard-strewn course before their rivals. The introduction of the visually-spectacular Air Jump was another masterstroke as the celebs did all they could to avoid the possibility of jumping onto an airbag that they couldn't really see. Additionally, I like the fact that the contestant's success is based purely on fact rather than the opinions of a panel of judges or audience members ringing in on premium rate phone numbers. The only major issue I have is that the episodes feel significantly padded out due to the fact that these events take so little time to complete. Amiable host Davina McCall does her best with the over-extended links but so far I haven't been able to watch an entire episode without boredom seeping in. So, whilst I admire Channel 4 for making improvements to the format, it's not a programme that I'll particularly excited about returning. One return I am excited about is that of Last Tango in Halifax which was announced on Twitter just after this Sunday's magnificent series three finale. Sally Wainwright's brilliant ear for dialogue was on full display as Gillian (Nicola Walker) voiced her doubts about marrying boorish childhood sweetheart Robbie (Dean Andrews). The structure of the piece saw Wainwright apply a non-linear narrative as Gillian flashed back to tell Caroline (Sarah Lancashire) about her dalliances with a younger co-worker as well as Caroline's ex-husband John (Tony Gardner). The realistic sequences were punctuated with some high comedy as Caroline struggled to change a tyre whilst wearing her Sunday best whilst Robbie looked on the verge of vomiting after overdoing it on his stag night the prior evening. Wainwright kept the audience guessing whether Gillian would marry Robbie while she also focused on the frosty relationship between Alan (Derek Jacobi) and his love child Gary (Rupert Graves). As the camera swept round the multitude of happy couples at Robbie and Gillian's wedding it reminded me just how much Wainwright had made me care about her characters. I'd wept with Caroline after she'd lost her partner and felt for Gillian as she drudged up the abuse that her late husband inflicted on her. Wainwright has been lucky to find an excellent ensemble cast who deal with her well-paced dialogue beautifully. Special mention has to go to Walker who is utterly believable, playing the likeable Gillian who is prone to making some terrible mistakes. The only criticism I have is the continued presence of Gardner's John who at this point I feel is surplus to requirements and I hope he doesn't return for series four. Apart from that though I would say that this is Last Tango's best series to date and I'm already ridiculously excited about what series four will bring. I think you must have been watching a different programme than I have re Last Tango in Halifax! Series 3 was a shadow of its former self IMO. It seems to have transformed from a quirky and refreshingly different character led series into a cliche ridden, boring soap opera. I think it is a case of the Emperor's New Clothes here. The sublime acting and sometimes sharply written dialogue covered up a multitude of sins with the general storyline.